Wondering how to cook Chicken Koftay without breaking? 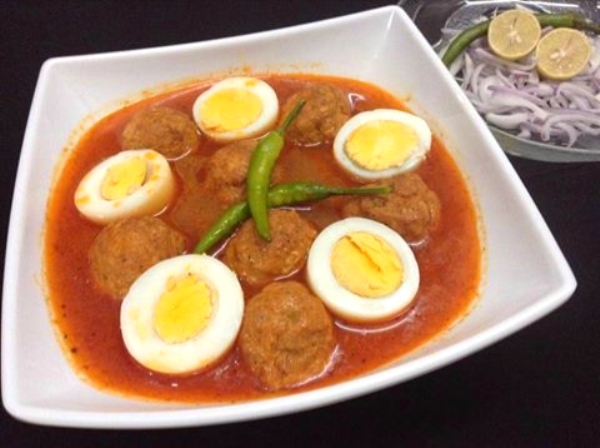 If you are going to cooking Kofta first time, then follow this easy step by step recipe. This Chicken Kofta Recipe will help you achieve perfect result. Pakistani Food Recipe is quite easy to make and a great way to get best flavor of kofta and gravy. Add chicken in food processor and process it to make mince. Take out in a bowl. Add salt, red chili powder, garam masala powder and half egg. Mix everything. If need add more egg. Make small balls and keep in a platter or tray. When balls are ready keep them in fridge. In meanwhile heat oil in a pan and fry onion until brown. Add ginger garlic paste, tomato paste and stir frequently. Now add salt, red chili powder and turmeric powder. When oil comes on top, add 2-3 glasses water. Allow water to boil then add kofta in boiling water. Cover and cook on high heat for 2 minutes then slow down the heat until water dries. Remove from heat and add yogurt, mix gently. Put on heat and cook until oil separates. Now add sufficient water, according to gravy you want. Cook for 10 minutes on slow heat. Sprinkle garam masala at the end. Dish out and serve with boiled eggs.